1. Melt the butter in a large pan until foaming. Add the shredded cabbage and coat in the butter. 2. Season and add the stock. Increase the heat to medium-high and sauté the cabbage, tossing regularly, for 6-7 minutes until glossy and tender. 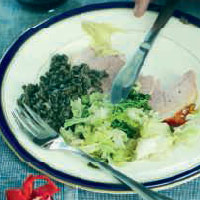 Serve with the ham and lentils.